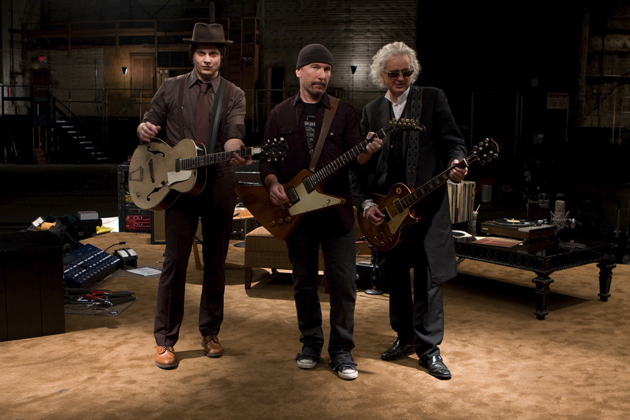 Non-music fans please be aware, if you haven’t heard the names Jimmy Page, Jack White or Edge, it might get dull. Though Guggenheim (the An Inconvenient Truth director) plucks three of the most influential and coming of age guitarists of their respectable decades, the 70’s, 80’s and 90’s, “It Might Get Loud” misses some of the larger or more vibrant connections these guitarists have, leaving the movie strumming a little too softly. By bringing three such prominent musicians together, many interesting story-lines are instantly created, Edge’s innovative electronic sound manipulation vs. White’s bare bones blues improvisation as well as each musician’s respective social context and upbringing. At times these perplexing relationships seem undercut to give more time for the guitarist to play fan favorites, leaving the audience a little thirsty for more interaction and unity between the riffs. But the production value is high, the music is well placed, and movie well-paced. Adequate attention on each musician’s hometown and back-story intermixed with an unmoderated roundtable talk of the three gives the documentary great melody. Getting all three of these well likable guys around was a great achievement in itself, given the fact that each one of them is a immensely interesting character. Unfortunately, there is little golden interaction between them. They don’t write a song together, talk about the guitar or technique. The money premise becomes just a sales pitch. Without knowing these guitarist, one can’t help to wish that it might have gotten just a little louder. This entry was posted in Reviews and tagged An Inconvenient Truth, David Guggenheim, Documentary, It Might Get Loud, Jack White, Jimmy Page, the Edge by LukeMiller. Bookmark the permalink. Being a huge fan of all three of these guys, been itching to see this for a while now. Can understand how there’s probably little draw to viewers who are out of the loop, but still, looks awesome. Good review. Thanks. Yeah, as long as your into music or any of these guys it is interesting as hell. I myself am a huge U2 and Jack White fan, so I was giddy as a school girl watching it. I just wish the doc was as good as the guitarists is all. I love these three guitarists, so that’s basically the main reason why I want to see it.